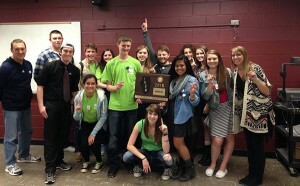 The journalism program at Huntley High School is experiencing a banner year, marked by two winners of national Quill and Scroll writing awards, a fourth-place team finish at the Illinois High School Association (IHSA) state finals and a bevy of individual awards from the IHSA, Illinois Journalism Education Association, and Northern Illinois School Press Association. Sophomore Palak Patel (feature writing) and junior Adam Reckamp (editorial writing) won Quill and Scroll national awards. Below are accolades received at different levels of competition. This is the sixth time HHS’s journalism team has finished in the top five in the 10 years the competition has been held. In addition, senior Jess Calvero was named to the IJEA All State Journalism Team, marking the fifth consecutive time an HHS student has made the team. The HHS journalism program also was highlighted in the Northwest Herald for remaining a strong and in-demand program while many other area schools have folded their student newspapers and journalism courses. Catch up on some of the students’ work at http://huntleyvoice.com/.